Tribute (or Gong in Chinese) is one of the four major Xi Hu Long Jing production companies. This multi-award winning company prides itself on only using tea leaves harvested from the first degree of Xi Hu protected area. Their Xi Hu Long Jing tea has also been selected by Chinese Foreign Affair department to serve foreign VIP visitors, an honor known as "Guo Jia Li Ping Cha" or National Gift Tea in China. Tribute has also been honored as the care-taker of Chairman Mao's personal Long Jing tea plant when he was still alive. Xi Hu is now a protected area. Only the leaves picked within the designated 168 sq km of Xi Hu area can be considered as Xi Hu Long Jing. To ensure its authenticity, we will provide a coded anti-fake label issued by Hang Zhou's Quality Control Department. This product is also QS (Quality and Safety) certified. A Grade: Light and refreshing taste with a delicate nutty flavor. The sweet aftertaste completely fills your mouth after a few sips. Good even up to the fourth infusion. AAA Grade: Delicately sweet with a refreshing meadow-like flavor. The sweet aftertaste is only apparent after a few sips. We recommend a longer brewing time for this tea. This grade is more suitable for connoisseurs who enjoy light tasting tea. Jing Pin Grade: The taste of Jing Pin grade is more complex. This tea starts out light and refreshing with a hint of nutty notes but as soon as you drink in your first sip, you will notice a light fruity-sweet aftertaste in your mouth. The sweet aftertaste becomes more apparent after a few sips and is exceptionally lasting for a green tea. 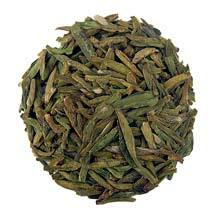 A Grade: Flat and narrow tea leaves comprising of one bud with one-to-two leaves variety. The color is somewhat dark-green but very fresh.